Minonk's oldest park is the Westside Park located between Washington and Jefferson streets and West Fifth and West Sixth streets. 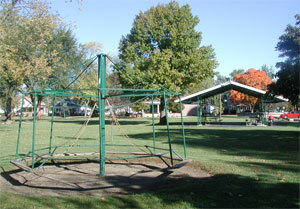 The park was created in the 1880's and was originally nothing more than a pasture. Today the park provides recreational and social facilities for Minonk residents. For the children there is playground equipment, for the teenagers there is a basketball court, and for everyone to enjoy is a new pavilion built with donated labor and funded in part by private donations. Click here for a list of donors to the pavilion. 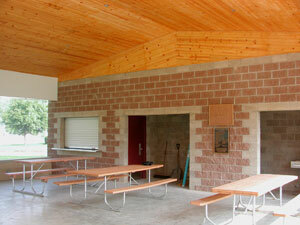 There is also an open shelter for relaxing or for picnics. 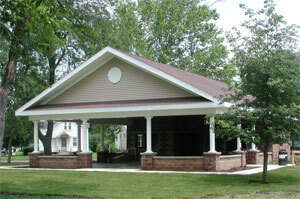 The new pavilion built as a war memorial has restrooms and a kitchen to accommodate large gatherings. 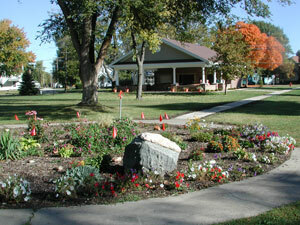 Local volunteers maintain a flower garden in the middle of the park. The interior of the pavilion is spacious and provides a panoramic view of the park. There is plenty of playground equipment in the Westside Park including this old fashioned merry-go-round. 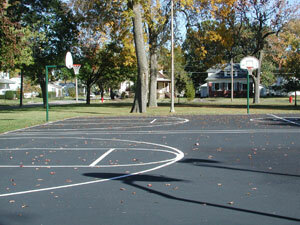 Kids can play basketball until 9:00 at night on the lighted courts.